In the Middle Ages most secular jewelry was understated, often taking the form of brooches and rings. Sacred metalwork on the other hand could be lavish, especially that made to house holy relics, and outfit the new cathedrals being built throughout Western Europe. Most of the brooches in this section are rather small, 30mm to 35mm. However their annular form makes them strong, light weight, and very secure. I made this annular pin to order quite some time ago, and of the thousands of brooches that I have made it is still one of my favorites. These are some of my most popular brooches, and so I almost always have some in stock. They are lightweight, sparkly, and very secure. Because of their small size these brooches are a good item to make from gold. The six sided form is a project that I sometimes give my students to challenge them. It is a forged form. No metal has been removed except the little slivers turned out by engraving. These are also available in silver for special order. The elegance of this design is striking in its symmetry. 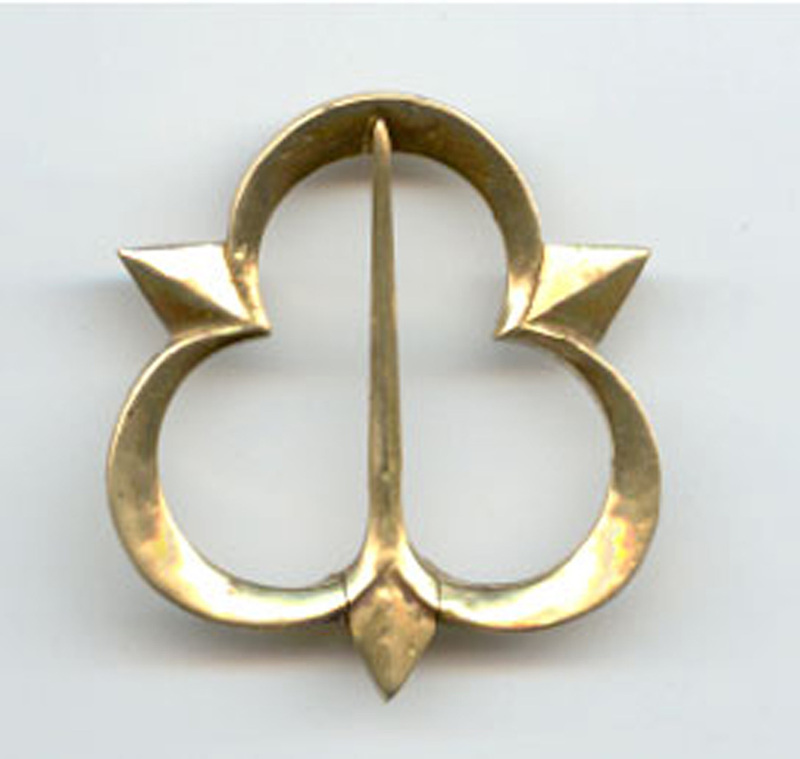 The pin hinges up from one of the barbs such that what you see when the brooch is fastened is a nearly perfect trefoil shape. These are also available in silver, and in a larger size, 90mm, request in both bronze and silver. Small brooches may be ordered in a wide diversity of shapes, and with all manner of gemstones. These are part of an order I made up for a customer some time ago. The thriftiness of medieval peoples never fails to amaze me. Everything seems to have ben re-worked into something else. So I was heartly amused the first time I saw an example of a brooch cut from a coin in a batch of artifacts from a dig. When my friend G.P.Franck-Weiby, a coin die carver, gave me a batch of scrap silver as payment for a project that included some mis-struck groat reproductions, I had to give it a try. 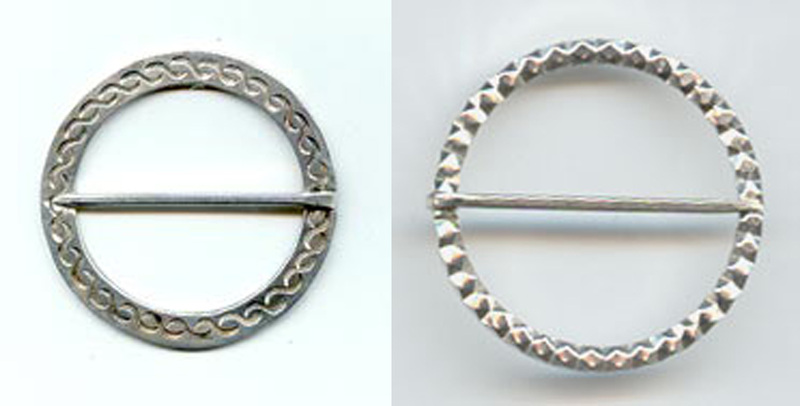 I cut the larger brooch so to show the ends of the long cross pattern, and the inscription “MEVM-POSVI-JAH-ADIVTORE”. 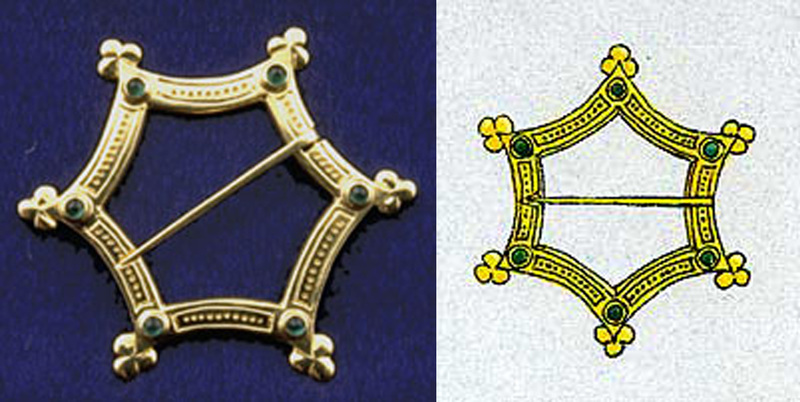 The smaller brooch shows the tressure and the crown from the king’s portrait on the front of the coin. The button is reversible, but I have chosen to face the side with the center of the long-cross and pellets, rather than the king with his eyes put out. 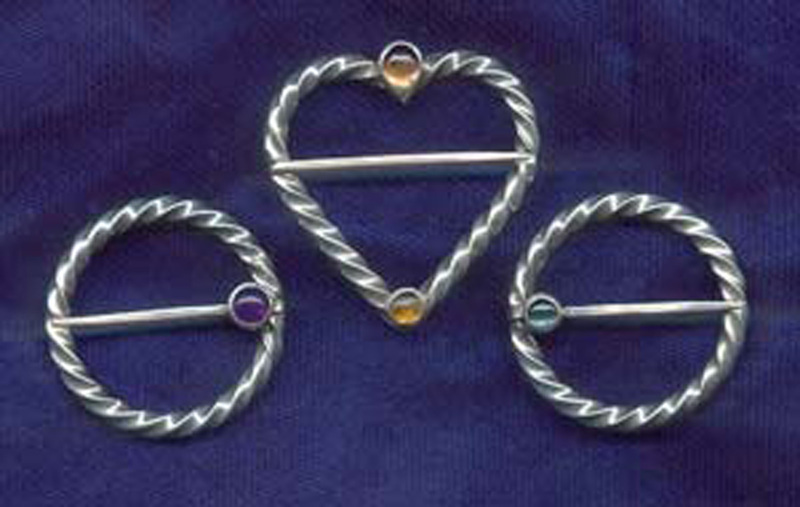 In the Middle Ages rings tended to be simple bands,often of base metals that had been gilded. They sometimes would be set with a single stone, or be engraved with part of a prayer or poem. Two obvious exceptions to this were ecclesiastical rings and signet rings for sealing documents. Both of these designs were made for custom orders, but I now keep castings of them on hand to set and sell. Images of more rings will be posted here soon. 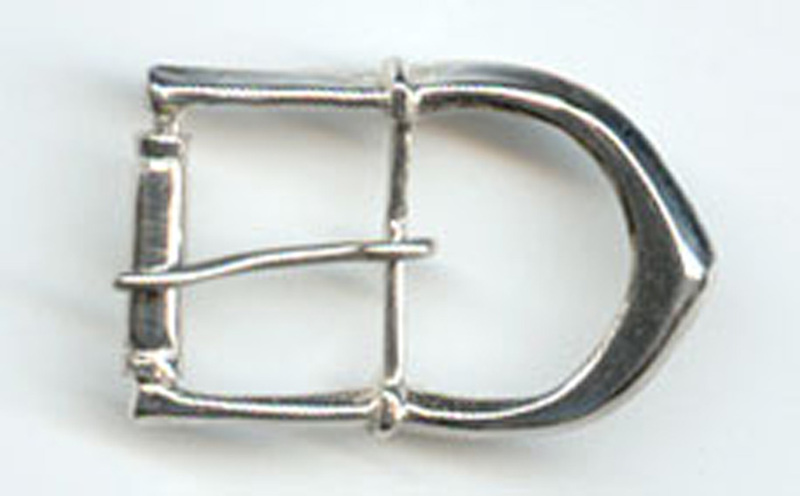 These little 12th century German buckles are popular among historical shoemakers. I am always happy to go to a faire and see some of them on someone’s shoes. A friend of mine went to Glastonbury some time back, where grows the thorn tree that tradition holds sprung from the staff of Joseph of Arimathea. Thorn trees shed a lot of branches, and so holy relics are not too hard to get there. My friend brought some back along with jugs of water from the holy well. He collects holy water from shrines and sacred springs all over the world. It is not the strangest of his hobbies, but he is an odd guy. The relic is set under a hollowed out bit of rock crystal, about the size of a duck egg. The background is painted sheep vellum, with gold leaf around the edge. 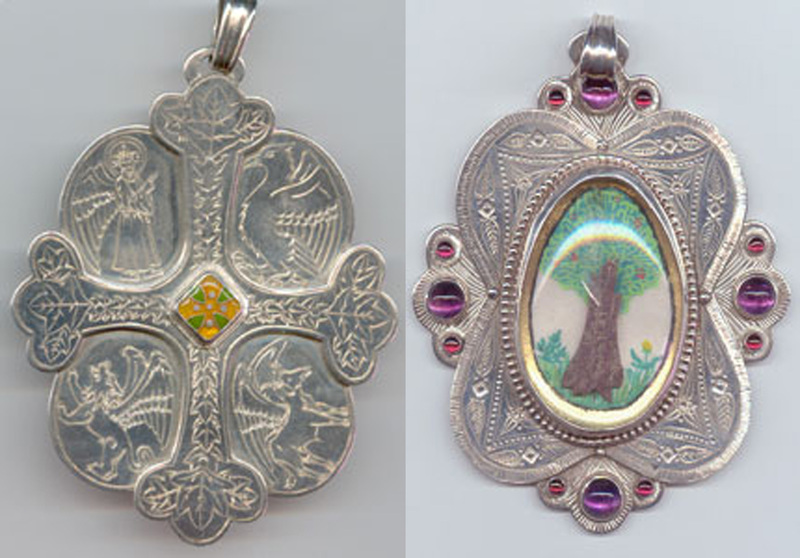 The body of the work is engraved silver set with stones, and an enamel on the reverse.